In 2002, the Canadian Safe Boating Council (CSBC) struck a Taskforce to examine mandatory PFD use for recreational boaters in small crafts. The CSBC commissioned SMARTRISK, a national injury prevention organization, to develop a background research paper. 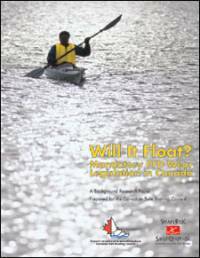 The research paper "Will It Float? ", was released at the CSBC 2003 Symposium and AGM in Montreal Quebec on September 26, 2003. You can download from the CSBC Web Site the 286-page research paper prepared by SMARTRISK, which is available in a PDF format, the summary version of the study in a PowerPoint presentation and the Report from the PFD Taskforce of the CSBC, also in PowerPoint format.